Vampyr Gameplay Trailer Details Story and Combat | Nerd Much? From Dontnod, the studio behind Life is Strange, comes a gameplay trailer for their upcoming title, Vampyr. In this ten minute video, we see Dr. Jonathan Reid go through a portion of a mission within the game. Sean Hampton, a patient turned rogue vampire at Pembrook Hospital, rather abruptly murdered another patient, the walls dripping with the blood of his victim. Reid is sent to investigate, and focuses on where Hampton was last seen at the docks in order to put an end to what will likely be chaos drenched in red. Reid goes to the hospital and runs into trouble: The Guard. A fanatical group ready to murder vampires on the spot, but it seems that Reid is safe for the moment; lucky that hospitals are sacred ground, no murder allowed. Reasons why what Hampton did was so wrong, apparently. Various conversation options make it clear that Reid can decide between a range of rude and diplomatic choices. We also see some of the abilities gained by being a vampire, like what I can only describe as this game’s version of Blink from Dishonored. As well as the classic fancy “vision” to find clues to your quest, sometimes known as Eagle Vision or Witcher Senses depending on the game. 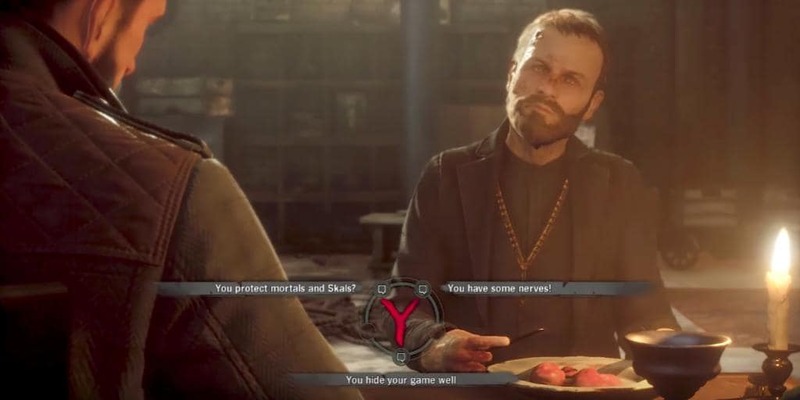 Vampyr, for those that don’t already know, follows the story of Dr. Jonathan Reid and his mission to continue being a doctor and uphold his Hippocratic oath after being turned into a vampire. Obviously this doesn’t turn out, as he ends up making a living hunting down errant vampires who can’t seem to keep their fangs in their mouths long enough to take their victims somewhere more respectable. Vampyr will release in November 2017 on the PC, PS4, and Xbox One.